If you are garlic and cheese lover, must try this. The taste is amazing and ginger is match with milk tea. 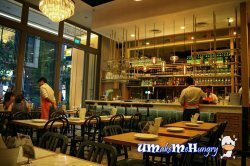 Been wanting to try out the food here after hearing my friend's positive review after dining at the branch in the east. I absolutely love the decor and ambience of this restaurant. It is modern and chic, very heavy on wood with warm colours like orange and brown used. There's also a bar at the side. On a side note, I also like how there are options of 'less spicy', 'normal' and 'more spicy' when you order your food via the menu on their iPad. Makes ordering really convenient. Mango Lassi: This was not bad, you could taste the mango and yoghurt distinctively, sweetness was okay with a slight tartness from the yoghurt. It was quite thick at first but after the ice melted it was just right. Biryani: Nothing special about this. Can be improved with a stronger taste of spices. Butter Chicken: This was ok. I'm not a butter chicken kinda person so I don't have much comments for this dish, but it was definitely not bad. Aloo Gobi: This is a curried cauliflower & potato dish. The cauliflower was cooked till soft yet still slightly firm. Loved the texture. 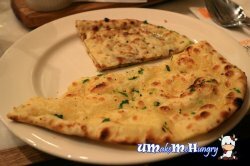 Garlic Naan: As the biryani was not sufficient for 2 of us and there were still dishes left, we got ourselves the naan. This was not bad, but wish there was a stronger garlic taste. All in all, everything was good. The service was also pretty good as all the staff were friendly, prompt and helpful. Thumbs up! Zaffron Kitchen, aplace where I get to enjoy the authentic North and South Indian Cuisine in Westgate. 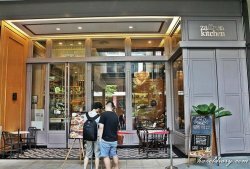 Having voted the Best Indian Restaurant 2013 by the Restaurant Association of Singapore, Zaffron Kitchen is known in the media with their excellent mixed of North and South Indian Fare. The environment was very relaxing with chic vintage and modern settings. 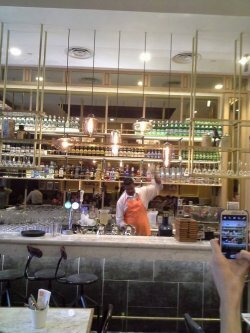 Not only that they have a nice bar. 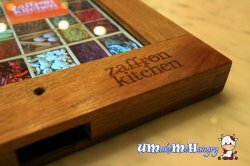 Food Menu was no longer presented in booklets form, instead Zaffron had make use of the advancement in technology by using ipad installed with their in house application for ordering. Well, now that they are at our finger tips by pointing on the screen and sending the order to the kitchen. However, if you need miss some human touch, you can still wave your hands for their assistant. When asked, they were all ready to elaborate on the dishes. 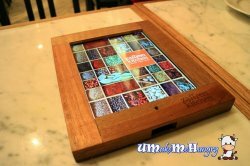 Even the housing of the ipad blends well into such elegance environment, it was wooden framed, sturdy with their name crafted at the bottom. Though heavy, I will say that the workmanship was pretty well done. 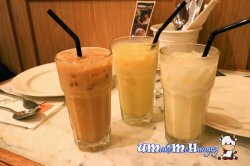 Beverages were first to reach our tables, mango and banana lassi were refreshing. 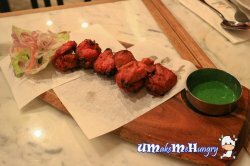 For the meat lovers, this Chicken Tikka is one of the chef recommendations. Fire your appetite with these skewered juicy chicken, marinated with spices, yogurt,and baked to juicy goodness in their traditional Tandoor oven served with chutney on a solid wooden board accompanied by refreshing salad. They were acceptable but a tad too salty. Two other signatures item we had on the Naan List which helps to polishing the curry dishes clean. 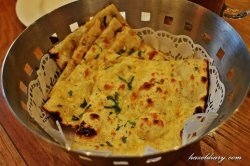 Naans are known as Indian Favourites, Zaffron had them baked in Tandoor Oven until perfection. 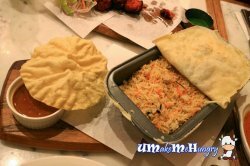 Served in buckets, these pieces of naan were pretty decent and satisfying as they were not greasy. 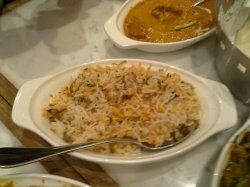 The rendition of Indian Classic, Dum Biryani! Enjoy the flavourful basmati rice sealed in tins with a ghee-slicked baked dough drawn over its top. Flip over the dough and feel a gush of spice-kissed basmasti rice fragrance with succulent mutton and hard boiled egg snug within these fluffy soft grains. Delicious! No meal is ever complete without having desserts and we had rounded off the meal with them! 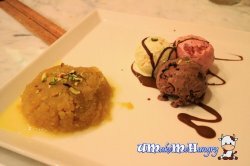 Moong Dal Halwa is actually a dessert make of lentils, it was rich and buttery with milk, sugar as its main ingredients topped with roasted pistachios. It went pretty well with cooling Movenpick's Vanilla ice cream. Thankfully the service of Zaffron was friendly and courteous. They handled the feedback seriously and most importantly with a smile. If you are craving for some old-fashioned favourites from the tandoor and zesty curries, Zaffron Kitchen will definitely worth one's visit. My sister and I will go Jurong area at least once a month. This time round, we decided to settle our lunch at Westgate mall. 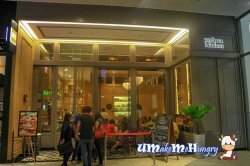 As we were walking around the mall deciding what’s for lunch, we chanced upon this classic modern style serving Indian cuisine. We decided to give it a try. Zaffron Restaurant serves north, south Indian cuisine and as well local Indian foods. 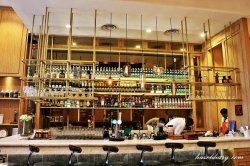 The interior design of the restaurant is classy with wall glasses at the entrance of the restaurant and westernize bar when you step in. We were introduced to their online ordering system instead of having the traditional ordering. Thus, this explains why they only have 2 service staffs for the whole restaurant. 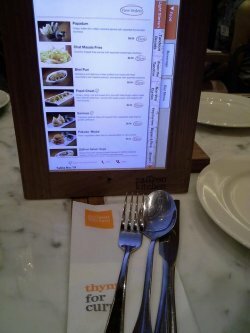 The mini Ipad ordering was easy and user-friendly. We took our time browsing through the online menu and placed our order. The whole process took us less than 10 minutes and waited patiently for our orders to process. 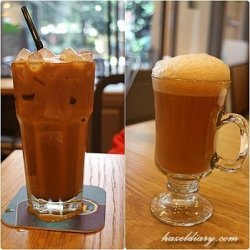 Drinks that we ordered were Ice Kopi S$4.50 and Teh Tarik S$3.50. Sisters ordered Chat Masala Fries @S$5.00 as the starter for the main course. 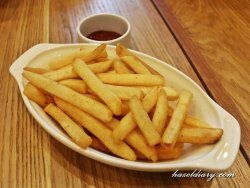 The fries are crispy with light masala taste. Dum Chicken Bryani S$13.50 serving was generous. 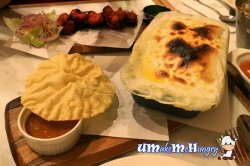 The dish was served sealed with a thin layer of dough with hidden briyani, chicken thigh and egg. Something different in terms of presentation and at the same time retains the flavors and taste of the dish. 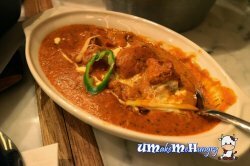 I ordered Garlic Naan S$4.50 and their signature Butter Chicken S$16.00 to complete the meal.Chicken Tikka marinated in a delightful yogurt and spice mixture with butter flavored gravy perfect for the naan. The ambiance of the restaurant was perfect for dinning as a couple or in small group. Pleasant and peaceful moments with cosy chatting session over the lunch as the restaurant is quite empty. Service staffs were quite friendly and provide suggestion on foods recommendation. 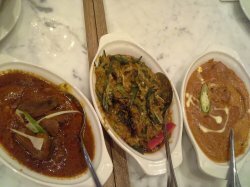 Zaffron Kitchen serves an excellent mix of North, South and local Indian favourites. 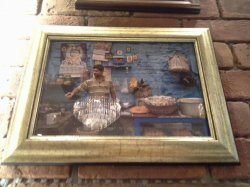 The restaurant displays pictures of Indian lifestyle. It is a modern restaurant does not give the impression of dining at Little Indian or Race course type restaurant. 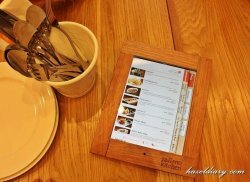 The restaurant is very IT savy as menu is presented in iPad. a) Naan : It is plain Nann. 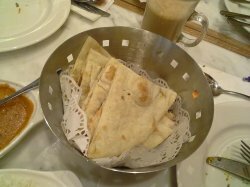 It is just as good as Roti Prata except that it is not oily. The Naan is very crispy. 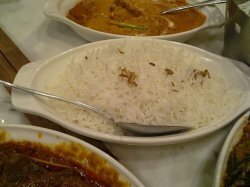 b) Basmati Biryani Rice : The rice has not have fragrance. c) Plain rice : The rice is soft. 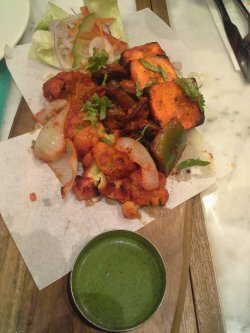 Tandoori Mixed Grill (Vegetarian) ($29) comprises Panner Tikka, Tandoori Gobi and Tandoori Mushroom. Most of the dishes are very done. The dish is spicy for Chinese diner. 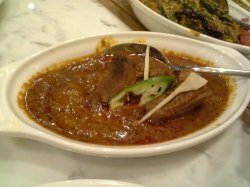 Okra Masala ($10.50) is a delicious lady finger dish flavoured with an array of spices like coriander, turmeric, cumin seeds, cayenne. The lady fingers is not the ordinary long and 10 cents width lady finger. The finger is very thin and short. I did not taste of the gel of the lady finger. 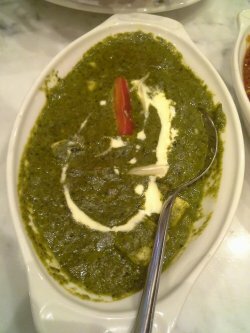 Palak Pareer ($13) is a vegetarian dish with Indian Cottage Cheese served in rich spinach gravy. 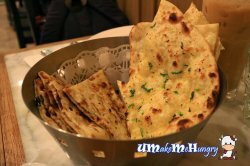 This dish is good to dip with Naan as the gravy is thick. Mutton Rogan Josh ($15.50) is a low fat and mildy spiced lamb curry. Usually, there is a smell for mutton but this dish does not evolve any smell. I believe the works of spices do a great job. Its meat is tender and really no fat. As for the gravy, it looks oily but forget about it. Taste it to believe that it is really good. 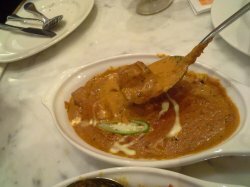 Butter chicken is the signature dish. Chicken Tikka marinated in a delightful yogurt and spice mixture and simmered in a rich tomato, cashew nuts, butter flavoured gravy accented with dry fenugreek. This dish tastes better with served with rich or Naan. The chicken is well marinated. The bite of chicken was tasty. 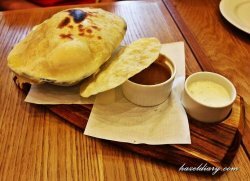 The gravy is thick and buttery and yet not strong in spices aroma. All the dishes were prefect. The waitress was fast in serving and also display its art of making Teh Tari.